In recent years, FinTech, driven by a combination of factors such as technological advances, financial deepening, and changing customer bases, has been growing rapidly in China, creating significant impact on traditional financial products, businesses, services, and organizational structure. This paper provides a systemic summary of China’s FinTech development on multiple dimensions including main business forms and technologies, focusing on the regulation and self-regulation of China’s FinTech industry, offering an in-depth analysis of the challenges the industry faces, and proposing corresponding recommendations to promote development. Born in response to economic needs, the field of finance has been driven by an inherent impetus to absorb valuable elements, including technological innovation, to benefit its growth. The development of China’s financial sector has been accompanied by continuous technological advances. After financial electronization and informatization, Internet Finance began to grow rapidly in China and gained widespread recognition since 2013, thanks to the development of new network information technology, giving rise to various new business forms and models such as third-party payment, P2P loans, and crowdfunding, and creating a series of innovative Internet Finance businesses driven by data and technology, while prompting traditional financial institutions, represented mainly by commercial banks, to accelerate deployment of strategies and businesses in this new area, thus improving the breadth, depth, and precision of the application of emerging network information technology in finance. China’s many years of practicing Internet Finance has proved that Internet Finance can play a positive role in promoting financial inclusion, boosting the quality and efficiency of financial services, and meeting diverse financing and investment demands, making it a sector with significant market and development potential. Since 2015, FinTech has gained worldwide attention and become a global topic, with converging understanding of its concept by various countries and relevant international organizations, as in the case of using Alternative Finance in the UK to refer to FinTech in the earliest stage and the term Digital Finance used in technical documents by international organizations such as the World Bank. The concept of Internet Finance was created against the backdrop of China’s endeavor to push forward the “Internet Plus” strategy across all industries and thus bears unique Chinese characteristics and time-specific features. Judging from their financial function and business nature, we maintain that the above concepts are not fundamentally different when we delve into their shared essence. In China, both FinTech and Internet Finance refer to the new characteristics, platforms, and business forms in the area of finance, created by the marriage between finance and technology, driven by financial needs and bolstered by emerging technology. The business models and innovative technologies involved in the two concepts are generally the same, which is why we shall not distinguish between the two in the remaining sections of the paper. In recent years, thanks to the widespread application information technologies such as digitization, network connection and smart technologies (In 2016, the number of Internet users in China reached 731 million, or 53.2% of the population, while the number of mobile network users hit 695 million, growing by more than 10% for the third year in a row. The proportion of users accessing the Internet with cellphones has been increasing continuously, up from 90.1% in 2015 to 95.1% in 2016.) and the enormous market demand brought forth by the initiative to promote financial inclusion and serve the real economy, FinTech has been growing by leaps and bounds with the help of an inclusive, innovative regulatory environment, attracting vast quantifies of capital and benefiting financial consumers while creating unique market and scale advantages. (1) Internet payment maintained rapid growth, while the number of mobile payment transactions surpassed that of Internet payment. In 2016, the total number of Internet payment transactions reached 112.5 billion, up by 61%, amounting to a volume of 2,139 trillion yuan. 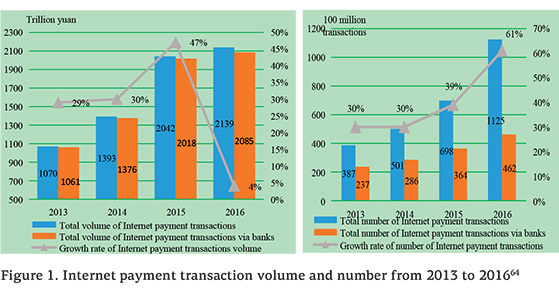 Commercial banks maintained their dominant position, accounting for 97.5% of the total Internet payment transaction volume, while non-banking Internet payment, dominated by small payments, registered rapid growth, with the annual number of transactions up by 98.6% and transaction volume surging by 124.3%. As for mobile payment, transaction volume reached 209 trillion yuan, up by 60.2%, while the number of transactions was 122.8 billion, up by 128.06%. (2) The number of P2P loan platforms decreased with growing trade volume and lowering rate of returns for P2P products. By the end of 2016, the number of P2P loan platforms in normal operation was 2,649, down by 28.1% from 2015. Year-end total loan balance was 803.4 billion yuan, a year-on-year increase of 84.1%, while the accumulated annual volume of loans was 1.9975 trillion yuan, a year-on-year increase of 103.3%, involving 51.09 million participants (including lenders and borrowers), up by 35.96 million from last year. Mean rate of return for investors was 9.3%, down by 1.8% from that of 2015. (3) Internet insurance slowed down with changing proportion of sources of premium revenue; share of life insurance in Internet insurance premium rose significantly. In 2016, the total premium revenue for Internet insurance increased by 7.6% to reach 234.8 billion-yuan, accounting for 7.6% of the total premium revenue of the insurance industry. Life insurance premium revenue, in particular, grew by 32.8%, accounting for 82.8% of that of the whole Internet insurance segment. (4) Internet consumer finance took on diverse financial service scenarios and participators, with younger users and predominantly small loans with short maturities. Taking 6 representative institutions surveyed by the National Internet Finance Institute of China for example, the number of users and the volume of new consumer loans granted for 2016 increased by 38.5% and 219.1% respectively compared to the previous year. Users of Internet consumer finance services are mainly young people born in the 80s or 90s, who have a relatively advanced concept of consumption. And the newly granted loans are mainly used for online shopping, renting apartments, purchasing vehicles, education, and vacation, etc. More than 90% of the users had a loan limit of less than 10,000 yuan, with the number of loans worth less than 1,000-yuan accounting for 80% of the total number of loans and more than 90% of newly granted loans with shorter than 6 months of maturities. (5) Product and service models continued to evolve in Internet direct banking. By the end of 2016, 69 commercial banks in China had built Internet direct banks (excluding WeBank and MYbank). More than 80% of the direct banks were initiated by city commercial banks and rural commercial banks, forming a product and service system composed of depositing, investment and wealth management, money market funds, loans, remittance, and value-added services, realizing rapidly expanding customer base and trade volume. In terms of institutions, with China’s traditional financial institutions moving faster into the FinTech industry, a virtuous relationship featuring both competition and cooperation between various types of market entities is gradually taking shape. The conceptual, technological, and model innovation brought about by FinTech has stimulated traditional financial institutions to continuously transform their business models and service forms, push forward strategies for FinTech development by leveraging their unique characteristics and competitive advantages, adapt organizational structure, build core brands, and improve portfolio of business forms, realizing rapid growth of client base and transaction volume in key areas such as Internet consumer finance, mobile payment, and Internet insurance. Meanwhile, traditional financial institutions and emerging Internet businesses are increasingly engaging in cross-industry, cross-institutional cooperation by capitalizing on their respective endowments. China Industrial and Commercial Bank, China Agricultural Bank, Bank of China, and China Construction Bank, for example, have embarked on cooperation with JD, Baidu, Tencent, and Alibaba respectively to explore innovative FinTech products and services, realizing a mutually reinforcing, win-win relationship and cultivating a more open FinTech ecosystem for cooperation. On the other hand, FinTech is increasingly driven by technology, with deepening application of emerging technologies such as big data, AI, and blockchain in the financial sector in China. For example, big data has been wide applied in precision marketing, service innovation, operational management, and risk control, fine-tuning financial businesses, reducing information asymmetry, lowering marginal costs, and boosting transaction efficiency, thus enabling more financial consumers to enjoy secure, convenient financial services at reasonable prices. Meanwhile, the big data technology has made statistical monitoring, analysis, projection, and risk alerts more accurate and efficient, enabling more targeted, scientific regulation. Cloud computing, with its advantage in system structure and resource allocation, has contributed to the intensive development of financial services by adapting to new characteristics of Internet financial services, such as high instantaneous concurrency, high frequency, and enormous traffic, and better meeting the diverse demand of long tail customers for financial services. The continuous application of AI technologies such as voice processing, image recognition, machine learning, and deep learning has enabled financial services and products to “understand words and languages”, realizing seamless connection to and synergy with consumers, helping them with financial decisions, and promoting continuous optimization of front-, mid-, and back-desk procedures within financial institutions. Biometric Identification technologies using such as identification of fingerprints, vocal prints, facial features, and iris has been increasingly used in scenarios such as account log-in, identity authentication, and small payments. In addition, new achievements have been made in the application of the blockchain in areas including clearing and custody of funding, digital notes, and capital transaction, but generally speaking, the technology is still in the nascent stage, with its use limited to lab experiments or small-scale situations and few cases of commercial or production use. The advent of FinTech has provided important impetus for the deepening of China’s financial reforms, improvement of the market system, and transformation of the development model of financial development. On the other hand, FinTech is still rooted in the finance industry and falls within the confines of financing, credit creation, and risk management. FinTech has not changed the hidden, sudden, and contagious nature financial risks, nor the negative externalities they can bring. As a result, FinTech has posed a new issue and challenge to financial regulators in China. Against this backdrop, reviewing and modifying existing regulatory concepts, framework, standards, and tools to adapt to FinTech innovations have become a crucial part of China’s efforts to build a modern framework for financial regulation. In July, 2015, the People’s Bank of China, the China Banking Regulatory Commission, the China Securities Regulatory Commission, the China Insurance Regulatory Commission, and the Ministry of Finance jointly published the Guiding Opinion on Promoting the Healthy Development of Internet Finance, proposing a series of policy measures to encourage innovation and support the stable development of Internet Finance in line with the general framework of “encouraging innovation, guarding against risks, leveraging pros and avoiding cons, and promoting healthy development”. The Opinion also established the principles of “lawful, appropriate, category-based, coordinated and innovative regulation” and defined the boundaries of major business forms, as well as relative regulatory requirements and division of responsibilities between regulators. As a result, the Opinion has become the guideline for China’s overall Internet Finance development. In line with the requirements of the Opinion, relevant regulatory agencies also rolled out a series of regulatory rules for related business forms in Internet Finance. For example, the People’s Bank of China published regulation such as Measures on Protection of Non-Financial Institution Payment and Measures on Management of Customer Provisions on Payment Platforms, building a basic legal framework for payment management. The China Banking Regulatory Commission published Temporary Measures on Management of P2P Lending Infomediaries, Guidance on the Documentation and Registration Management of P2P Lending Infomediaries, Guidance on the Funding Custody Business of P2P Lending Infomediaries, and Guidance on the Information Disclosure of the Business Activities of P2P Infomediaries, forming a regulatory framework. The China Securities Regulatory Commission rolled out Measures on the Supervision and Management of Money Market Funds, setting out rules on information disclosure, risk disclosure, and forbidden actions for money market funds. The China Insurance Regulatory Commission publicized the Temporary Measures on Internet Insurance Businesses, stipulating standards on the operational condition, business scope, information disclosure requirement, and relevant regulatory rules for insurance institutions engaging in Internet insurance businesses. With the continuous development of FinTech, the business operations of institutions in the industry are becoming increasingly mixed, leading to overlapping products and compounding of businesses. To address this phenomenon, Chinese regulators actively explore the method of penetrative regulation for FinTech to see through the appearance of financial products and identify the essence of financial businesses and activities, connecting the dots between sources of funding, intermediate links, and final destinations. Valuing essence over appearance, regulators seek to identify the entities to be regulated and applicable rules based on the function of products, business nature, and legal properties, monitoring the businesses and activities of industry institutions along the whole procedures. In actual practice, penetrative regulation can help address new regulatory challenges brought by FinTech. First, penetrative regulation is required of all FinTech institutions engaging in financial businesses and providing financial services, irrespective of the nature of their financial products and service providers, subject to basically identical market access policies and regulatory requirements, ensuring fair and consistent regulation. Second, penetrative regulation places great emphasis on considering information along the whole business chain, including sources of funds, intermediate links, and final destinations of funds, so as to identify the essence of businesses, the entities to be regulated and applicable rules, helping to eliminate overlapping regulation and regulatory arbitrage. Third, penetrative regulation requires regulators to enhance coordination and information sharing among themselves so as to determine the risk profile and overall leverage of relevant activities and ensure total coverage of FinTech regulation. Fourth, penetrative regulation stresses the verification of end investors, identifying the undertaker of final risks and returns, implementing management of investor suitability, and ensuring the right products are sold to the right investors. Fifth, penetrative regulation focuses on the inspection of funding flows between related financial groups as well as their assets, liabilities, and governance structure, which serves to guard against unfair competition, transferring benefits for personal gains, and inappropriate related-party transactions, etc. Compared to traditional financial services, FinTech is highly virtual, transcends geographic regions, and involves a large number of participants. In addition, many of the customers of FinTech are long-tail customers and disadvantaged groups, making it necessary to enhance the protection of FinTech consumers. To this end, Chinese regulators have engaged in multiple endeavors. First, build and improve the third-party custody system and require FinTech institutions such as P2P loan infomediaries and third parties to institute third-party custody of client funds in commercial banks and ensuring the security of the funds of financial consumers. Second, reinforce information disclosure. Formulate guidelines on information disclosure and standards, urge FinTech institutions to disclose operational and financial information in a timely manner to help financial consumers gain sufficient knowledge of the operational status of the institutions and prompt industry players to operate with prudence and control relevant risks. Third, step up monitoring of Internet advertisement and urge advertising media to take on the responsibilities to review the the content, realizing effective regulation of advertisements abut FinTech and wealth management product. Fourth, improve management of investor suitability. Formulate management regulations on investor suitability, urge FinTech institutions to comply with investor suitability rules, and ensure financial consumers invest in products suited to the risk to their levels of risk tolerance. Fifth, push forward financial consumer education. Provide various forms of training on FinTech knowledge and issue risk alerts to improve the financial literacy and risk prevention capabilities of consumers. Looking back on the world history of financial development, due to the intrinsic frailty and lagging external regulations, the nascent stage of every major financial innovation often came with rapid accumulation of risks, leading to financial crises in some cases. In China, FinTech brought about certain issues and hidden risks despite its rapid development. This issue is especially poignant in the case of some “black sheep” of the industry which deviate from the right track of innovation and disrupt normal financial order, driving out players which comply with laws and regulations, severely damaging the reputation of the industry and the confidence of consumers, and endangering truly valuable Internet Finance innovations. To address this issue, at the beginning of 2016, China launched the Thematic Regulation of Internet Finance Risk, highlighting the principles of targeting problems, regulating by category, and implementing comprehensive measures. The aim of the initiative is not to negate the benefit of Internet Finance, but rather, to protect law-abiding businesses by cracking down on those which break the law, thereby effectively regulating operational activities and recovering a healthy, orderly environment for the development of Internet Finance. Judging from the effects of the initiative, the overall market environment has been gradually improved and a mechanism for fair market competition has been recovered, enabling businesses which obey the law to eliminate unscrupulous players. Some of the small-scale institutions which profit by luring investors in with high returns instead of building their strength in their business sectors, now have no choice but to stop their operations and seek other business opportunities, enabling orderly phasing-out of underperformers. Industry self-regulation is an important mechanism where institutions and practitioners in the same industry, in an effort to protect and further shared interests, unite on a voluntary basis to formulate rules to regulate their own behavior and realize self-management within the industry. With the continuous innovation and development of the Internet Finance industry in China, ever increasing market complexities have continued to add to the direct and indirect costs of government regulation, making it necessary to introduce industry self-regulatory organizations and social resources to bring out the role of self-regulation in facilitating market communication, market-oriented constraints, and risk mitigation and serve as a conducive complement and vigorous support to the relatively rigid administrative regulation. The dynamic evolution of international financial regulation has also shown that financial regulators adjust regulatory measures based on the level of accumulated and exposed risks. With sound industry self-regulation, the industry will develop in an orderly manner. And when industry institutions practice prudent compliance, regulation will be made more flexible and effective. A lack of industry self-regulation, on the contrary, will force regulators to be less tolerant and implement stricter regulatory concepts and more rigid regulatory measures. Against this backdrop and in line with the Guiding Opinion on Promoting the Healthy Development of Internet Finance, in March, 2016, the People’s Bank of China, the China Banking Regulatory Commission, the China Securities Regulatory Commission, the China Insurance Regulatory Commission, and other relevant governmental bodies jointly founded the National Internet Finance Association of China (NIFA) with the aims to regulate the market behaviors of industry institutions, protect the legitimate rights and interests of the industry, encourage industry institutions to better contribute to social and economic development, and guide the compliant and sustainable development of the industry through self-regulatory management and membership services. Currently, NIFA has more than 500-member organizations, covering institutions in banking, securities, insurance, funds, futures, trust, asset management, consumer finance, and credit reporting, as well as Internet finance institutions in payment, investment, money management, and lending. The members also include institutions in financial institutions and financial research and education, covering main business forms as well as emerging ones in Internet Finance in China. (1) Build an industry self-regulatory system and organizational structure. NIFA formulated and implemented fundamental regulations such as Approaches on Member Management, Self-Regulation Pact for Members, and Approaches on Self-Regulation and Penalty Mechanism, building a solid foundation for effective industry self-regulation. NIFA established special committees covering areas including statistics, P2P loans, credit building, cyber and information security, and mobile finance, giving full play to the functions of the committees on discussing issues, making planning, and implementing actions by relying on self-regulation and self-discipline of the industry. (2) Push forward the building of Internet Finance standards. Taking into account top-level design and prioritizing urgent needs, NIFA founded the Research Institute of Internet Finance Standards to plan the standards system of Internet Finance, publish and implement management measures for group standards, and formulated seminal standards covering areas such as information disclosure, contract specifications, debt collection, and Internet Finance cloud computing. (3) Reinforcing building of industry infrastructure. NIFA launched the Internet Finance Registration and Disclosure Services Platform, connecting more than 100 P2P infomediaries, many of which disclosed their institutional, operational, and financial information to the public for the first time on the platform. NIFA’s Internet Finance Statistics Monitoring and Risk Alert System collects a wide range of data from Internet Finance institutions including operational information, product anomaly, and transaction-specific information, measured against nearly 1,000 metrics, and sets 23 rules to identify abnormal platforms and thresholds to caution against risks. In addition, NIFA has launched the Internet Finance Credit Information Sharing Platform, which can effectively integrate and utilize useful information to address problems such as “a single borrower borrowing from multiple platforms” and fraudulent borrowing. Finally, NIFA’s Internet Finance Complaint Information Platform serves to provide leads for financial regulators to crack down on activities in violation of laws and regulations. (4) Providing Internet Finance training and education. NIFA has built a multi-layered, multi-dimensional training system, covering more than 1,000 trainees and nearly all member institutions in the past year. NIFA actively organizes activities such as quiz contests and campus lectures on Internet Finance, promoting the financial literacy among consumers. In addition, NIFA issued timely alerts on cryptocurrency and ICO, helping investors to enhance their ability to identify risks and achieving considerable influence both at home and abroad. (5) Enhancing theoretical and empirical studies on Internet Finance. Each year, NIFA compiles the China Internet Finance Annual Report to provide a comprehensive view of and deep insights into the current development and future trends of China’s Internet Finance industry. As for research, NIFA has carried out targeted research on empirical issues such as the various business forms of Internet Finance, and the application of RegTech and blockchain in finance, as well as hot issues or difficult issues such as the orderly phasing-out of P2P loan platforms, digital currency, ICO-related risks and regulation, achieving multiple research results. (6) Stepping up international exchange and cooperation. In the presence of Chinese Premier Li Keqiang and Luxembourg Prime Minister Xavier Bettel, NIFA and Luxembourg House of Financial Technology signed a Memorandum of Understanding to enhance civil communication and cooperation in the field of Internet Finance between China and Luxembourg. Furthermore, NIFA jointly held the UK-China FinTech Collaboration Forum with the Department for International Trade UK, and received visits by the World Bank, Inter-American Development Bank, Financial Conduct Authority, and the City of London government, enhancing the international community’s understanding of China’s Internet Finance development and work in self-regulation. Currently, China’s FinTech industry is in a leading position globally in terms of growth rate, market volume, and innovation capabilities, garnering increasing international following. With rapid development, however, certain problems and challenges are being exposed and accumulating, calling for serious attention and resolution with systemic plans. (1) Negligence of the financial essence of FinTech. Without a sufficient understanding of the roles of finance as the core and technology as the medium in FinTech, certain FinTech practitioners deliberately isolate finance from technology and blow the importance of technology out of proportion while ignoring fundamental financial rules, leading to “excessive innovation” which goes beyond the development stage of the institutions in question and the economy at large and beyond their risk control capabilities, as well as “pseudo innovation” which deviates from actual economic needs purely to stand out. Meanwhile, given FinTech’s short history, startups in the industry have not experienced the test of financial risks, leading to insufficient awareness of risks and inadequate risk management capabilities. In addition, the big data model and pricing system which FinTech relies on, have not yet gone through the test of complete economic cycles, leading to uncertainties about the efficacy of the models during economic downturns in particular. (2) Compounding of financial and technological risks. As an ancient Chinese saying goes, “The water that bears the boat is the same that swallows it up.” Advanced technologies, if used improperly in finance, could be the very force that brings more serious damage to financial activities and the finance industry as a whole. For example, FinTech, in providing financial services across markets, institutions, and geographic regions, also renders financial risks more contagious and the scope of potential damage greater. In speeding up and increasing the flow of funding, it also accelerates the rate of spreading risks and financial losses. In making infrastructure and financial services more open and transferring them online, it also accumulates risks related to reliance on technology and network security. Furthermore, by relying on the Internet and economy of scale, players in the industry find it easier to engage in mixed operations, which may give rise to issues such as unfair competition and systematic risks. (3) Impact on monetary policies. When it comes to policy tools, certain FinTech businesses can, to some extent, create currency, blurring the boundaries between traditional currencies and lowering the effectiveness of quantitative monetary tools pegged to supply of broad money. In terms of transmission of monetary policies, FinTech increases uncertainties about liquidity demand in the financial market, which may augment market volatility and make it more difficult and more costly for central banks to engage in open market operations. As for the intermediate targets of monetary policies, with the rapid expansion of electronic currencies brought about by the likes of Internet payment, currency in circulation will be reduced, creating more uncertainties in the estimation of money multipliers, velocity of circulation, and demand function, and making the intermediate targets of traditional monetary policies less effective. (4) Increasing the difficulty in consumer protection. The long-tail customers, who are the focus of FinTech businesses, often lack financial literacy and capabilities, and require more protection. In addition, certain population groups such as farmers and low-income citizens often lack FinTech knowledge and skills, giving rise to “digital divides” between citizens of different levels of education, different ages, and from different regions and leading to disparities in the abilities of different groups to benefit from financial services. Moreover, disadvantaged groups are more reliant on physical branches, which may lead them to reject FinTech when more physical financial service spots are transferred online. Furthermore, there is still room for improvement in infrastructure building, development of original business models, R&D of core technologies, improvement of regulatory and governance systems, and formulation of industry standards for China’s FinTech development. Looking into the future, China’s FinTech industry will face changing macro conditions such as economic, social, technological, and financial elements. The new normal of the economy and the development of digital economy will further complicate the operational environment of FinTech players, the formation of the social cyberspace and the continued accumulation of people’s wealth will provide a solid customer base for the industry, the deepening of informatization and ongoing technological advances will create highly efficient information infrastructure and technological conditions for the industry, and the building of a modern financial system will cultivate a more sound financial market and regulatory environment for FinTech. Generally speaking, in the future, the opportunities and the pros outweigh the challenges and the cons for China’s FinTech industry, ushering in a beneficial period for the industry’s development. To grasp the valuable opportunities for FinTech development, address the challenges therein, and promote the normative, healthy development of China’s FinTech industry, industry players, regulators, and industry self-regulatory organizations should evaluate all FinTech activities by examining the basic principles of whether they are conducive to improving the efficiency of serving the real economy and the level of financial inclusion, to enhancing the financial risk control capabilities, and to strengthening consumer protection, and engage in FinTech innovations in proactive, steady, and orderly manner in line with the principles. (1) Continuously optimize policy environment. Adhere to fair access to the market, equitable competition, and just rules for players in the FinTech market and endeavor to break unreasonable policy constraints and systematic bottlenecks so as to enhance the intrinsic impetus for FinTech development. Foster a favorable policy environment for the development of FinTech with coordinated and integrated monetary, credit, fiscal, and tax policies and accompanying policies, each with its own priorities. (2) Enhance support for innovation. Encourage traditional financial institutions and emerging FinTech businesses to leverage their own advantages within the limit of laws and regulations, and engage in innovation of diverse, tailor-made, and precise FinTech products and services driven by market demand and supported by new technologies, so as to improve the competitiveness of the FinTech industry and cultivate leading FinTech enterprises with global edge. (3) Improving the governance system. Establish a sound system for behavioral regulation, prudent regulation, and market access for FinTech, and utilize FinTech to improve the procedures and capabilities in regulation, explore innovative governance mechanisms for FinTech, including regional pilot programs, product testing, and pressure tests, and bring under control the risks created by innovation. Meanwhile, give full play to the role of industry self-regulation in lowering the overall risk probability of the industry through formulation of industry standards on information disclosure, information safety, and business operation and urge industry institutions to enhance risk control capabilities. (4) Improving infrastructure. Increasing diversified investment from the public and private sectors, and further improve infrastructure systems including those for payment, clearing, and communication, so as to enable FinTech services to spread to a wider range in a secure, credible, and economical manner. Build and improve infrastructure such as statistics, risk monitoring, and credit information systems to consolidate the foundation for the sustainable development of FinTech. Accelerate the building of standards system to improve the level of standardization of the FinTech industry. (5) Strengthen consumer protection. Practice the concept of “responsible finance to improve the management of investor suitability. Properly resolve the issue of “digital divide” and prevent new financial inequality. Explore measures such as digital, visual information disclosure, product registration, and risk alerts to enhance the transparency of the the whole procedures of FinTech services. Take advantage of a wide range of channels such as traditional and digital media to provide precision education on financial knowledge systemically, and improve consumers’ capabilities and literacy in FinTech. Nowadays, with its vigorous innovation capability and vitality, FinTech is making the finance industry faster and more efficient and enabling better financial services and products. Amidst the global FinTech boom, China now stands at the forefront of the industry. However, we must still observe, analyze and explore the FinTech industry from multiple perspectives with an objective mindset, striving to build, in a steady fashion, a system of FinTech services and governance which is truly suited to China’s economic and financial development so as to realize steady and fairly fast growth of business volume, improve the efficiency of serving the real economy and the level of financial inclusion, and continuously improve the ecosystem and industrial chain of the industry, thus enabling innovation and technology to play a more important role in driving FinTech, significantly improve risk control and governance capabilities, and maintaining China’s leading position in FinTech development.